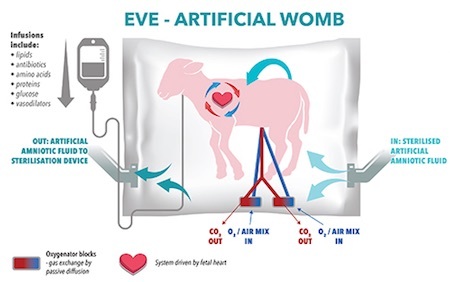 An artificial womb has been used to incubate healthy baby lambs, with an eye to an effective treatment strategy for extremely preterm infants. It uses ex-vivo uterine environment (EVE) therapy. Aldous Huxley described an artificial womb in his 1932 classic Brave New World. More recently, Lois McMaster Bujold described an uterine replicator in her 1986 novel Shards of Honor. Via Tohoku and EVE FAQ.